I am a self-taught cook. Growing up in the early 1970s, home cooking was making casseroles and big slabs of meat for family meals. I was more of a baker in my teenage years where the recipes were pretty straight forward. Launching into the world of good cooking is a leap of faith for me to overcome my fears of the ingredients and the kitchen equipment. I have transformed from the fearful to the Fearless Cook. This week I am taking on the Clay Cooker. It was given to me by my friend Joy, who should start her own blog on shopping at garage and estate sales. She is a master. So she dropped this clay cooker on my door step in a box and there it sat in my entryway for a couple of months. On a Saturday afternoon I pulled it out and read about it. Lucky for me there was a little instruction sheet included for care and cooking instructions. 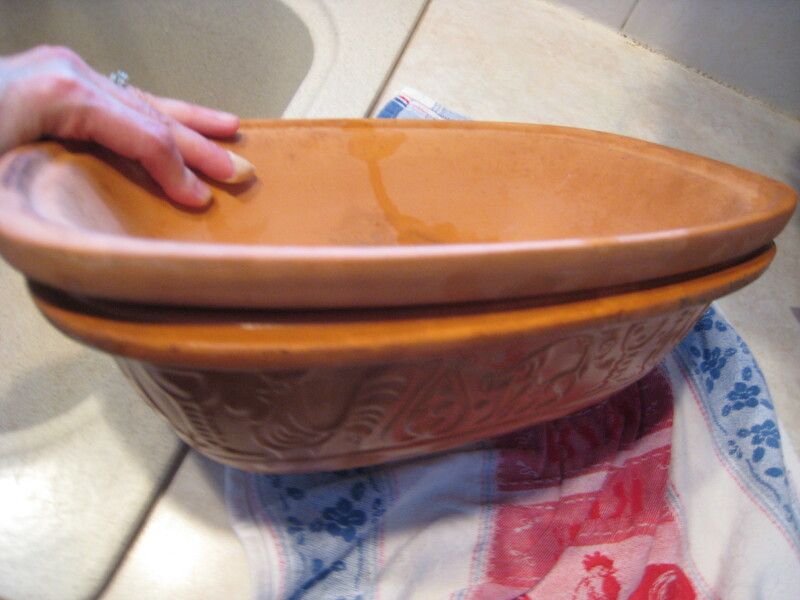 The one I have is a ROMERTOPF (Roman pot) which has an excellent online website. You can also type in the key word “clay cooker” and see what appears on the internet. The clay cooker has an interesting history in many cultures with various names for the pot. It is called by different names for Chinese (sand pots), Italian (tian), Spanish (cazuela), Moroccan (tagine). It’s like an ancient version of the crock pot – an all in one pot meal vessel. Whichever one you choose, follow the cooking directions closely because they all vary. Some are for oven use only, some are versatile enough to use on a barbeque. 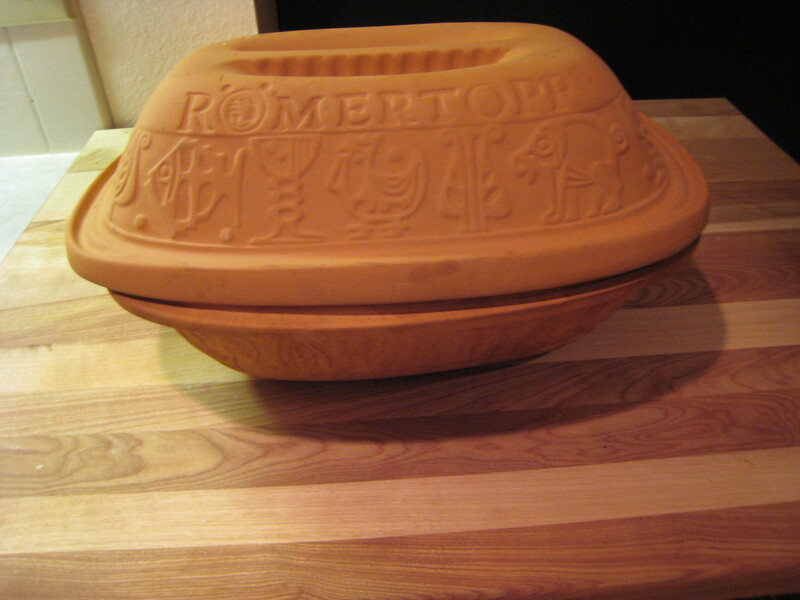 My Romertopf is an unglazed terracotta vessel and from the picture looks like a roaster. This one fits a whole chicken perfectly. 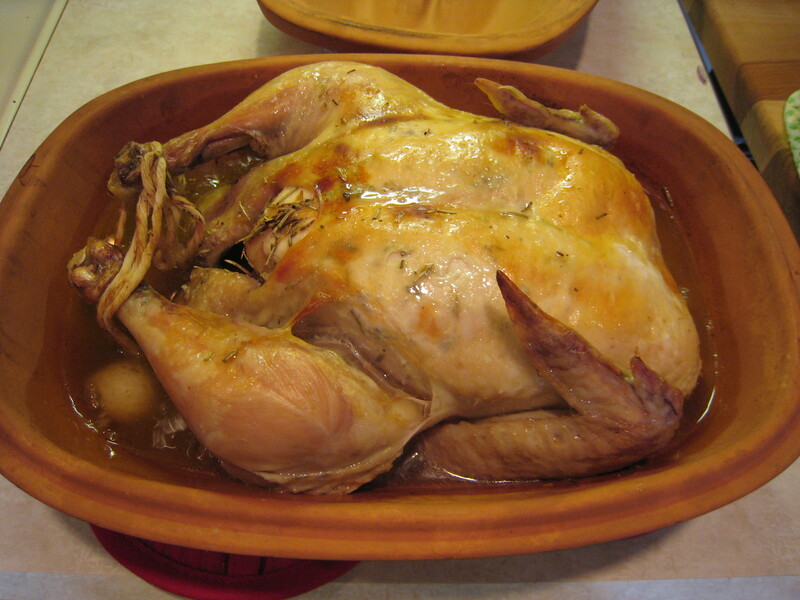 Cooking a whole roasted chicken is a perfect way to break in a clay cooker. This month in January 2011 Martha Stewart Living takes on the basics of the roasted chicken and Jan/Feb 2011 Cooking Light has Chicken Makeovers for the theme. A few rules. This type of cooking vessel has some special care instructions. 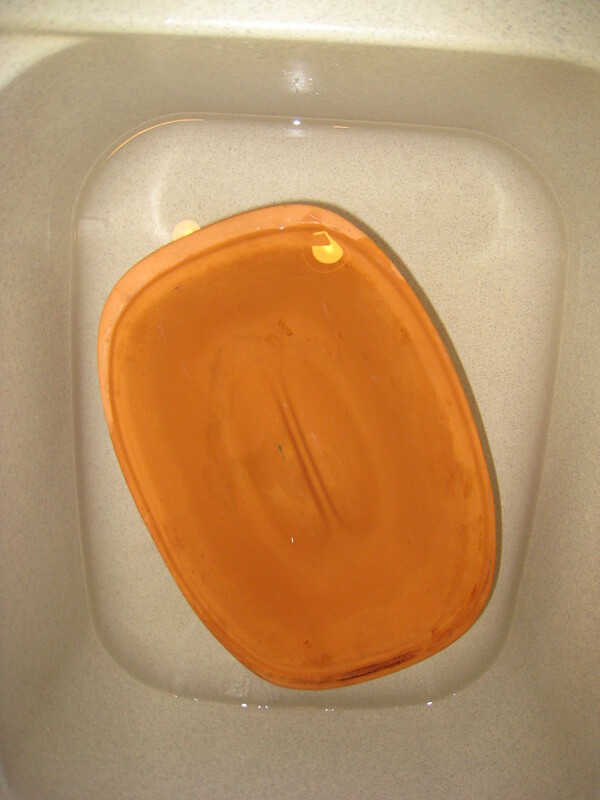 The clay pot and lid must be soaked in water for a least 15 minutes before using, if it is brand new 30 minutes of soaking for first use. 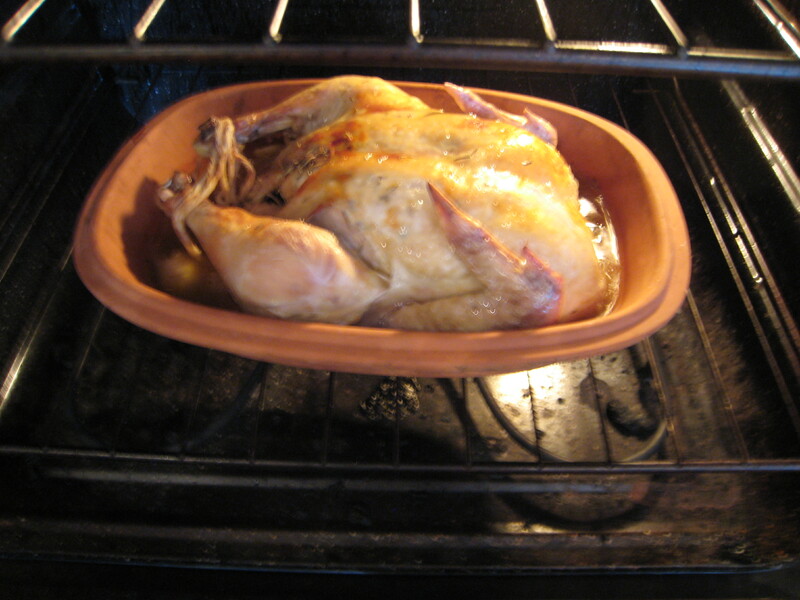 Once food is prepared it place it in your clay cooker into a cold oven then set the oven temperature. If using broth or water in the recipe, allow for additional time to cook about 15-30 minutes. Some instructions say to increase the oven temperature by 50 degrees – but I did not with my cooker. When using it for the first time and unsure, use a meat thermometer to check for doneness. There are some definite no-no’s in cooking with a clay pot cooker. 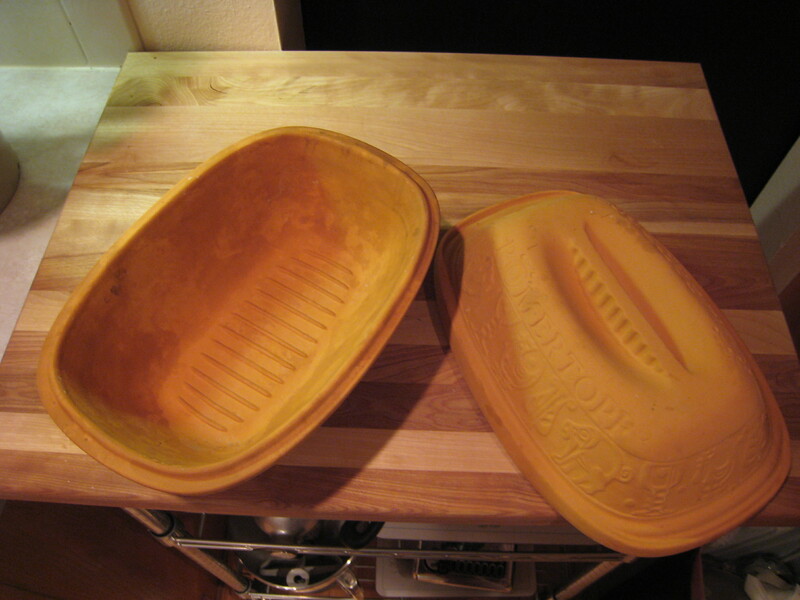 Never: 1) use it under the broiler; 2) let it touch the sides of the oven; 3) use it on a stove-top element. When removing it from the oven always set it on a hot pad to avoid temperature extremes from hot to cold or it will break. So here is my roasted chicken. It took about 1 hour 20 minutes of cooking with the lid on. I wanted my chicken browned so I removed the clay cooker lid and let it brown for about 15-20 minutes before removing from oven. Then I set it on top of oven pads on the counter and put the lid back on it to rest the chicken before slicing and serving. It can stay in the clay pot and not continue to cook yet stay warm. Cleaning and storage. A few more no-no’s involved with cleaning and storage. Never: 1) use scouring powders as they will clog the pores in the cooker; 2) put it in the dishwasher; 3) store with the lid sealed as mold may form inside. Clean it using salt or baking soda and water paste to remove debris. You could also add water to the cooker bottom and allow the water to come to a boil in the oven to loosen food debris. 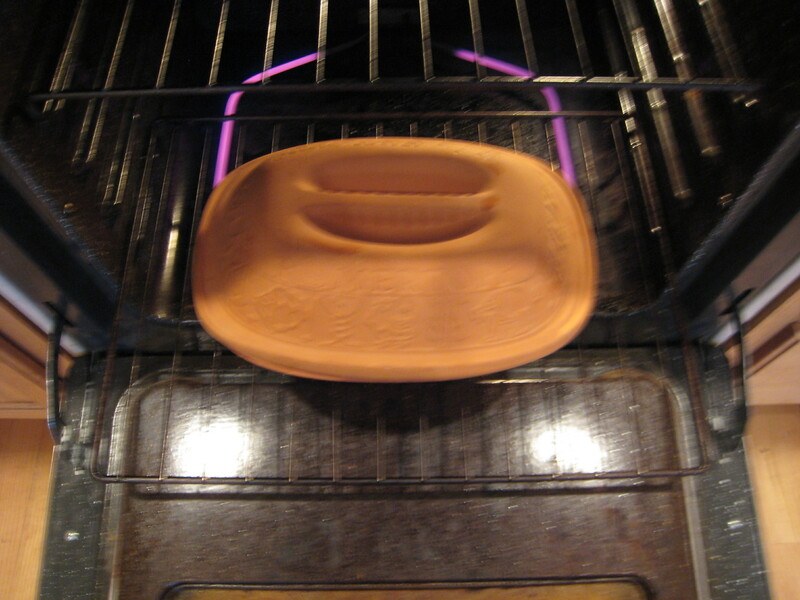 Air dry your clay cooker and store it lid inverted upside down into cooker bottom as shown below. This method of cooking has produced the juiciest chicken I have ever eaten. It steamed it in it’s own juices. It was yummy. Happy roasting. This entry was posted in Cooking, Food. Bookmark the permalink.